This topic describes service mesh for Pivotal Application Service (PAS). To deploy service mesh, see Deploying Service Mesh (Beta). PAS includes an optional, beta routing plane that uses a service mesh. A service mesh provides traffic management, security, and observability for microservices. For more information, see What is a service mesh? in the Istio documentation. The Pilot section in Istio documentation. The What is Envoy topic in the Envoy documentation. The istio-release repository in GitHub. Service mesh currently supports configuring routing weights for app. For more information, see Using Weighted Routing (Beta). It does not have feature parity with the existing routing plane in PAS. It is for deployments with fewer than 20,000 routes. At greater scale, it may impact core platform functions. The control plane is not HA and registration of new routes may be delayed during upgrade. The domain for routes is *.mesh.YOUR-APPS-DOMAIN and is not configurable. The following table describes each component VM deployed as part of service mesh in PAS, along with their function. 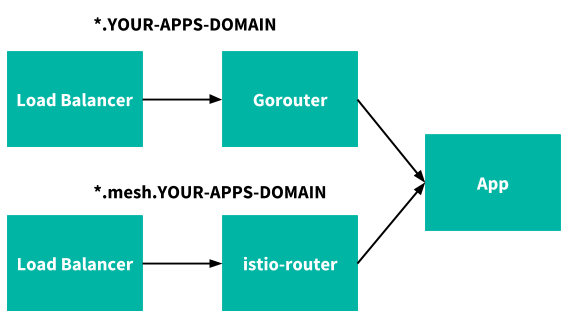 istio-router envoy A reverse proxy to forward HTTP/HTTPS requests external to the platform to applications on the platform. istio-control copilot, pilot-discovery Propagates PAS external routes to all service mesh routers. route-syncer cc-route-syncer Syncs routes created through the Cloud Controller API to the service mesh control plane. For information about the communication ports and protocols used by these components, see Service Mesh in the Routing Network Communications topic.